Those of us who regularly wear contact lenses know we should practice good lens hygiene, including taking taking them out at night and washing them with a sterile cleaning solution. But knowing doesn’t always equate to doing. For those who need a more visceral reminder of why these habits are so important, here are some gruesome stories about what can happen when you don’t keep your lenses clean. Just be warned: There’s popping involved. The cautionary tales—six in total—were collected from practising eye doctors and first featured in a report published by the US Centers for Disease Control and Prevention this summer. Now the case series has been republished in the January 2019 edition of the journal Annals of Emergency Medicine, along with an accompanying expert commentary. All of these stories involve people whose eyes went through hell, in large part due to their bad contact lens hygiene, particularly wearing or sleeping in them for long periods of time. In one case, a 34-year-old man who had worn soft contact lenses for 17 years was particularly lax about taking them out. He reported sleeping in them three to four nights a week and even swimming with them on. He eventually developed an infection and blurry vision in his left eye that wouldn’t respond to two months of conventional antimicrobial drugs. After further testing, it was discovered that the culprit was actually the protozoan Acanthamoeba, which can sneak into the eye through contaminated tap water used to clean lenses. Eye infections caused by amoebas like Acanthamoeba can be incredibly hard to root out. So the man was forced to use antiseptic eye drops for six months, at first needing to apply them every hour. And while the vision in his left eye did stabilise afterwards, he needed to switch to hard contact lens to get it back to 20/20. Still, he fared better than a 57-year-old man included in the report. This man visited the emergency room with trouble seeing in both eyes, along with acute pain. He reported not regularly cleaning or replacing his soft lenses and, prior to his visit, had worn them for two weeks straight. 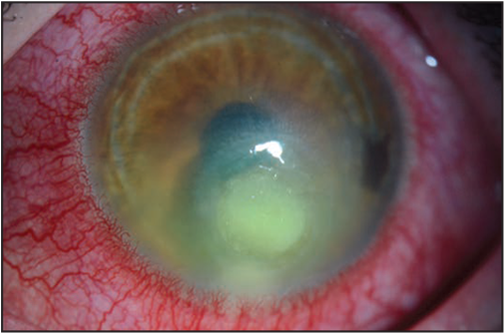 Both of his eyes were infected with bacteria, but the cornea—the clear, transparent layer that lines the front of the eye—of the right eye was so injured and punctured that he needed a corneal graft to save his vision. Even the above case doesn’t take the horror cake, though. That winner is likely the case of a 59-year-old man who wore his soft contact lenses for two days straight on a hunting trip; on the third day, he felt pain in the left eye. After visiting the doctor, he was diagnosed with a scratched cornea and given eye drops and special contact lens to help speed up his healing. His symptoms only got worse, until one day, after leaving the shower and wiping his eyes with a towel, he “heard a popping sound, and felt a painful sensation in his left eye.” GAAAAAAaaaaah. When he made it to an eye doctor, it was discovered that he had a large gaping hole in his cornea. He needed an urgent corneal graft to keep his eye from losing integrity altogether. But afterwards, following antibiotics and a later cataract surgery, his eyesight did recover to near normal. The other three cases thankfully don’t reach that level of squick, though they aren’t any picnic to read through either. There was a 17-year-old girl who developed a permanent scar in her right cornea after sleeping in lenses she had bought from a chain store; a 34-year-old women with an infection who hadn’t visited her eye doctor in more than five years, instead refilling her prescription online; and a 18-year-old boy whose eyes became juiced up with bacteria from sleeping in decorative lenses; he too was left with a scarred cornea. While these stories obviously represent the more extreme end of what can happen with bad lens care, even the average lens wearer is more likely to develop eye infections or other eye problems than people who don’t wear them. That risk can definitely shoot up if you’re not very hygienic or not staying in touch with an eye doctor. Three of the six cases involved people who bought or restocked their lenses without a valid prescription, and one person got an infection from decorative soft contact lenses used to change eye colour.